It was a mixed session for people who care about climate change and its effects. The state secured some large-scale wins, but failed to advance measures that would diversify the electrical grid and support individual households in reducing their own carbon footprint. And while measures to hold oil and gas companies accountable for violations of the Oil and Gas Act passed, there was little appetite among lawmakers for drawing more royalty money from an industry responsible for a billion dollar surplus this year. The flagship win for Democrats was the Energy Transition Act, SB 489, which commits the state to 100 percent carbon-free power by 2050. That bill schedules a payment plan for closing the San Juan Generating Station, a coal-fired power plant that supplies Public Service Company of New Mexico (PNM). The Senate passed a House bill last night on a 32:6 vote dealing with wastewater from oil and gas production, after the Judiciary committee amended it to grant the Oil Conservation Division authority to issue fines and fees. 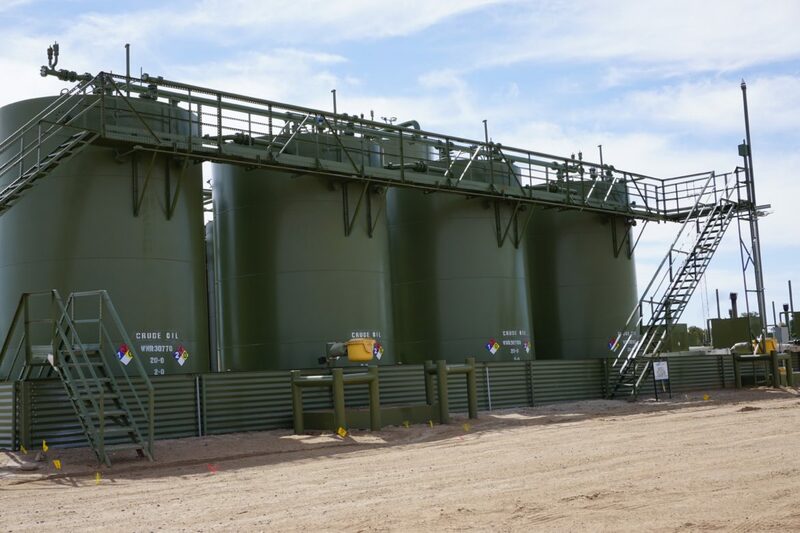 Now, if the House agrees with the amendments and the governor signs it, the OCD will, for the first time since 2009, be able to issue fines for violations of New Mexico’s Oil and Gas Act. The Senate amendments pick up an effort made by sponsors of SB 186, which was sent to Senate Finance and has yet to see a hearing. Initially, HB 546, titled the “Fluid Oil and Gas Waste Act,” sought to address questions around managing the estimated 1 billion barrels of water that emerge with oil through production. Companies had cited concerns over jurisdiction, liability and potential to retain proceeds among the reasons just 8 percent of water that comes out of oil and gas activities was being reused, Jennifer Bradfute, an attorney with Marathon Oil, told House Energy, Environment and Natural Resources committee members when that bill was first heard. Solar panels at PNM’s Santa Fe Solar Center. It went online in 2015 and produces 9.5 megawatts, enough energy to power 3,850 average homes. 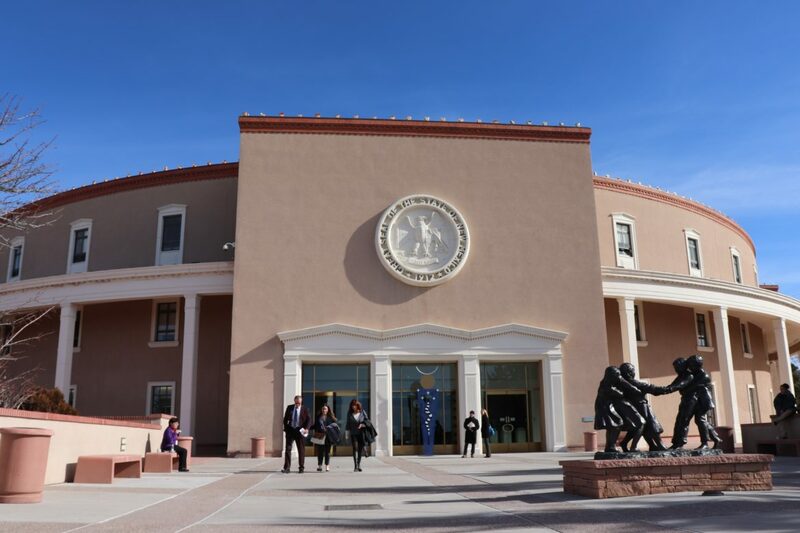 New Mexico’s lawmakers have approved the Energy Transition Act, SB 489, committing the state to transitioning to 80 percent renewable power by 2040. The act also helps Public Service Company of New Mexico (PNM) with the costs of closing the San Juan Generating Station. It directs $30 million toward the clean-up of the coal-fired power plant and the mine that supplies it and $40 million toward economic diversification efforts in that corner of the state and support for affected power plant employees and miners. Thermal image of emissions that aren’t visible to the naked eye. Credit: Sharon Wilson, Certified Thermographer, Earthworks Oil and Gas Accountability Project. 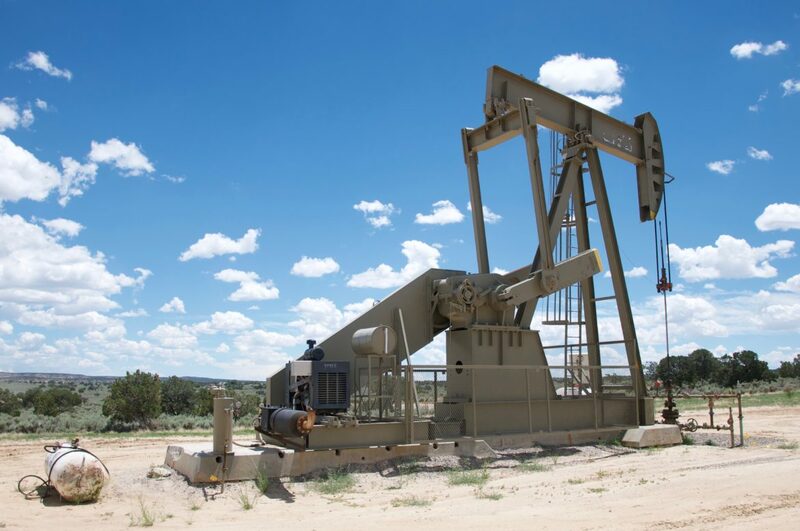 Reducing methane emissions from the state’s oil and gas industry was among the promises Governor Michelle Lujan Grisham made in her campaign, reiterated in her state-of-the-state speech in January and then acted on in an executive order. The order cites leaked, vented, and flared natural gas, the primary component of methane, as costing the state $244 million a year, and directs state agencies to develop a regulatory framework for those reductions from both new and existing sources. Methane, often released from oil and gas development, ranks among the most potent greenhouse gases, with a short-term warming potential that far exceeds that of carbon dioxide. In mid-February, 300 barrels of crude oil and 1,000 barrels of the salty, chemical-laden water that comes out of the ground along with fossil fuel spilled from a pipeline in northwestern New Mexico and ran for 1.6 miles down a wash. An employee with the company that runs the pipeline called the Oil Conservation Division. The agency’s online incident report describes an effort to stop the spread with earthen dikes and berms. Then, it snowed, covering the trail. The operator used absorbent pads and booms to try to recover some of the oil and liquids, and told the division it has plans to flush the area with fresh water to move the contaminants to a single collection point. Weeks later, the records don’t show whether the cleanup of either the water or oil was successful. The state’s Oil Conservation Division has been understaffed even as its workload has skyrocketed due to the ongoing oil and gas boom. So lawmakers are looking to help out by allowing the division to charge application fees. In January, Bill Brancard, general counsel for the Energy, Minerals and Natural Resources Department, which oversees the division, described to Senate Conservation Committee members a department unable to hold onto staff as experienced people jumped to more lucrative industry positions. They’ve been left with 19 full-time vacancies. At the same time, applications to drill have quadrupled in the last three years to 1,821 and administrative hearings have shot up from 271 to 1,502. It’s like cruising along in a refurbished airplane, which works well enough, but isn’t shiny anymore, then looking down at a new plane and deciding to jump out to ride in that one instead. And you’ve got all the parts in your hands to make a parachute, but you’ve got to put them together on the way down. That’s how one coal miner says the planned shut down of the San Juan Generating Station and its associated mine feels right now. He was one of a trio of miners who drove the three and a half hours Thursday to tell lawmakers in Santa Fe not to forget their communities as the San Juan Generating Station is taken offline. Already, he’s transitioned his kids through a recent divorce, he told House Labor, Veterans and Military Affairs Committee members, and now he faces the end of his job sometime before the generating station shuts down in 2022 and the possibility of moving if he can’t find work. “There’s no reason New Mexico can’t be the clean energy leader in the United States,” she declared in the pep talk that followed, and promised to address issues from solar tax credits to increasing renewable energy requirements for utilities, along with a list of others. And to do them fast. “This moment speaks to that kind of urgency, and we have to collectively make sure that the House and the Senate passes every single measure that allows us to not just have a foothold, but a clear design,” she said, before exiting to a standing ovation. The methane hotspot in the northwest. The town of Mesquite, where residents worry about air quality while living adjacent to Helena Chemical, in the south. Albuquerque’s South Valley and its air quality concerns. Proponents of the Environmental Review Act, HB 206, have a list of places where people and the environment could be better protected if the state had the environmental assessment tools it lays out. The bill bogged down in four hours of questions and public comment during its first committee hearing before the House Energy, Environment and Natural Resources Committee on a Saturday in January.